Late last year, after Skylark’s third year of performing an ever-evolving Christmas concert based around the music of Hugo Distler, our friends and supporters urged us to consider recording our unique program. As 2017 marks the 75th anniversary of his passing, it seemed to be a perfect time to create this recording. We are delighted to present Winter's Night, our inaugural recording for the Christmas season. In 1933, Distler composed Die Weihnachtsgeschicht (1933), a large-scale Christmas cantata for choir and soloists. Throughout the work, Distler interspersed seven variations of the classic Christmas hymn Es ist ein Ros entsprungen (“Lo, how a Rose E’er blooming”). His fantasia of sorts displays Distler’s unique style: heavily influenced by the polyphonic word painting of early vocal music (as well as the chorales of Bach), but with a modern sense of rhythmic and harmonic experimentation. The unique aesthetic of music by composers who lived through the inter-war period permeates many of the other anthems we offer – those by British composers Herbert Howells, Reginald Jacques, and Elizabeth Poston, as well as French composers Pierre Villette and Georges Dupuy de Méry. The most contemporary of the pieces we include is by John Tavener, who was born during the first week of the final bout of German air raids on London in 1944. Perhaps the most poignant connection to Distler’s life comes from the contribution of Peter Warlock, whose tragic suicide at age 36 in 1930 bears a striking resemblance to Distler’s own story. The pieces of early music we offer also connect closely to Distler’s sound world. Distler’s individual lines have a strong connection to Gregorian chant, which we present in one of its earliest forms (with a text from the 5th century paired with a melodic line from the 10th century or earlier). Distler’s 8-part “double choir” fifth variation is a modern re-creation of a Renaissance 4-part polyphonic canon. Alongside this variation, we share Jean Mouton’s stunning Nesciens Mater, a seemingly impossible canon at the fifth for two choirs. Four voices start the piece, and the other four voices join several beats later on the precise same material transposed up a perfect fifth: a brilliant illustration of the miracle of the virgin birth. We are particularly pleased to offer three world premiere recordings of pieces seemingly forgotten by history: Salvatorem Expectamus by Gregorio Allegri (of Miserere fame), Salve Regina by Giovanni Bernandini Nanino, and Marie berçant l’Enfant Jésus by Georges Dupuy de Méry. Skylark is a premiere vocal ensemble of leading American vocal soloists, chamber musicians, and music educators. 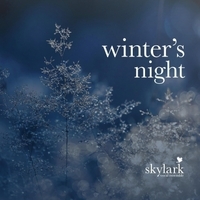 Skylark’s music has been described as “sublimely beautiful” (Opera Obsession), “engrossing…reaches in through the ribs and grips the vitals” (Q2/WQXR NY), and enough to “leave a hardened critic near tears” (Boston Music Intelligencer). With “some of Boston’s best singers” (Boston Globe), the voices of Skylark “can sway you softly into calm and then all but throw you across the room with sheer harmonic force” (Thought Catalog). Skylark strives to set the standard for innovative, engaging, well-researched, and dramatically presented programs that re-define the choral experience for audiences and singers alike. A not-for-profit entity, Skylark performs educational outreach programs with high school and college students across the United States during its concert tours.